Many patients want to know what to do with skin after extreme weight loss. Every patient is different and many will require skin excision. Fleur-de-Lis Abdominalplasty straight from the OR! She’s the perfect candidate because she has very high level of skin laxity around her stomach that has manifested into sagging folds of skin. 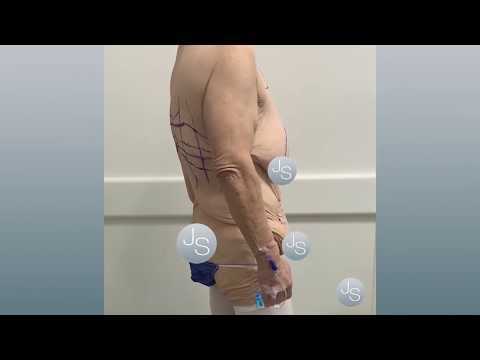 She was first liposuctioned, then remeasured, tailor tacked for precise skin excision, and then her skin was removed and stitched for a beautiful tighter stomach. ___________________________________________ Dr. Jaime Schwartz is the worlds leading expert body reconstruction and handling the most difficult breast tissue and implant cases. He is the founder of the Beverly Hills Breast Institute and the innovator of LipoLift. Many of his patients are weightloss and lipedema patients who need multiple procedures like a tummy tuck, liposuction, and skin tightening. Dr. Schwartz is known for fixing the most complex cosmetic procedures, breast reconstruction, treating lipedema, body sculpting, non-surgical fat reduction and skin tightening, vaginal reconstruction, obesity help and reconstruction, Renuva injections, J Plasma, and his minimally invasive technique LipoLift. Come in for a consult, our entire team love to meet you! We have offices in Beverly Hills and Dubai. Our team is dedicated to creating to safest space to listen with compassion and learn your story to plan what is the best cosmetic and medical option for you. Your best is the only one you’ve got and we’re here to help you through your journey.